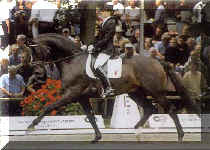 1996, 170 cm Dark bay. Reserve Champion 1998 NRW approval. his outstanding rida bility, excellent basic paces, good character, temperament and willingness to work were rewarded with top scores. Dressage index 133.68 and was 2nd place in the performance test at Neustadt/Dosse. His foals are blessed with generous movement and are of pronounced type.